The blog is on holiday - see you in a week or so. But in the meantime, here's a taste of Highland Park. No, sadly, not the whisky, but a park in Rochester, New York, one of those venerable cities on the old Erie Canal, now not quite as grand as it once was. Rochester is home to Kodak - what's left of it and Kodak founder George Eastman's mansion, music school and a good university. The park is most famous for its lilacs - which weren't in bloom yet. But the magnolias were - and how! The forsythia was doing well too. This almost looks like a Christmas tree. And through the trees the imposing tower of Colgate Rochester Crozer Divinity School. Looking like something very British. Rochester was not actually named, like many American towns, after its counterpart in Britain but after one Colonel Nathaniel Rochester, who fought in the Revolutionary War. Against the British. Of course. The park looks like something from Capability Brown but was in fact designed by Frederick Law Olmsted, who also did Central Park and a "park system" in Buffalo, now sadly wrecked since they decided to run a busy road through it. This could be Kew Gardens. The cannon, says the plaque, is a trophy from the Spanish cruiser, Castilla, sunk by the Americans in Manila Bay in 1898. It was presented to the city of Rochester by the US consul in Manila, who witnessed the battle. How's that for an intriguing bit of history? It's always worth reading those old plaques. 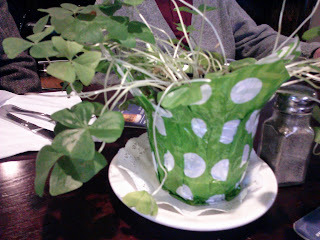 And another surprise - shamrock. Not in the park but in an Irish pub nearby. See you soon - watch this space!